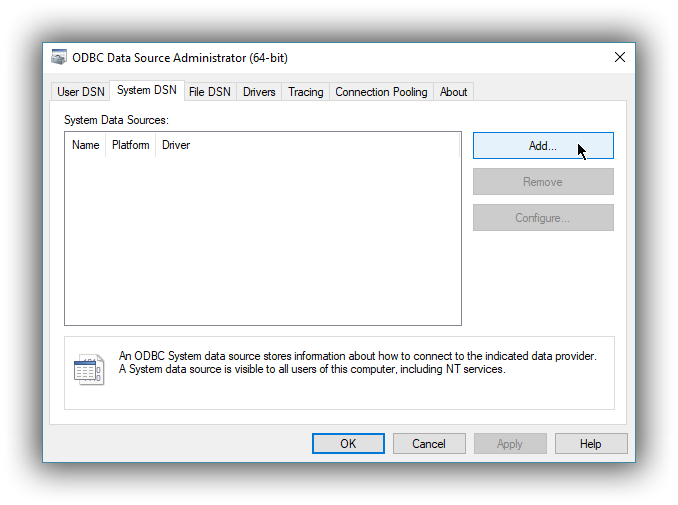 DSN (data source name) is a generic name given to the set of parameters an ODBC driver needs to connect to a database. We will refer to these parameters as connection parameters or DSN (despite some of these parameters configuring some other aspects of a driver’s functions; e.g. logging, buffer sizes…). Using a DSN is the most widely used, simplest and safest way of performing the driver configuration. Constructing a connection string, on the other hand, is the most crude way and consequently the least common method. We will focus on DSN usage only. 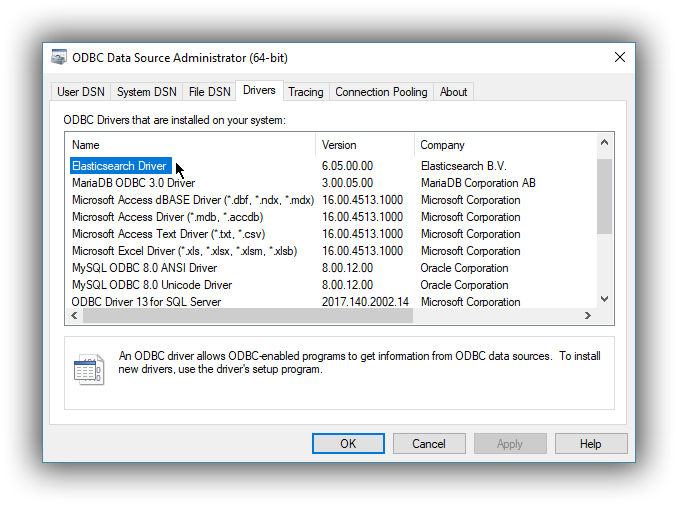 For DSN management, ODBC provides the ODBC Data Source Administrator application, readily installed on all recent desktop Windows operating systems. 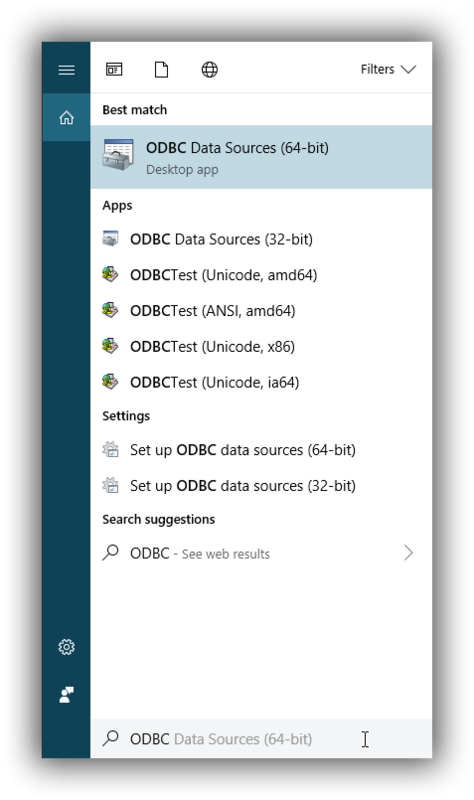 Launching ODBC Data Source Administrator. 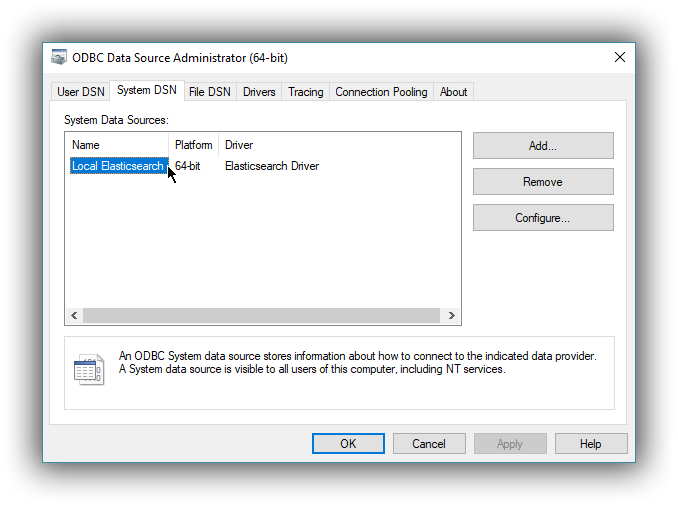 Once launched, you can verify that the driver was installed correctly by clicking on the Drivers tab of the ODBC Data Source Administrator and checking that Elasticsearch Driver is present in the list of installed drivers. You should also see the version number of the installed driver. The connections configured under this tab are only available to the currently logged in user. Each of these DSNs are referred to by a chosen arbitrary name (typically a host or cluster name). The actual set of parameters making up the DSN is stored through the driver in the system registry. Thus, a user will later only need to provide an application with the DSN name in order to connect to the configured Elasticsearch instance. This tab contains functionality that will allow to have one set of connection parameters written into a file, rather then the Registry. Such a file can be then shared among multiple systems and the user will need to specify the path to it, in order to have the application connect to the configured Elasticsearch instance. The configuration steps are similar for all the above points. Following is an example of configuring a System DSN. 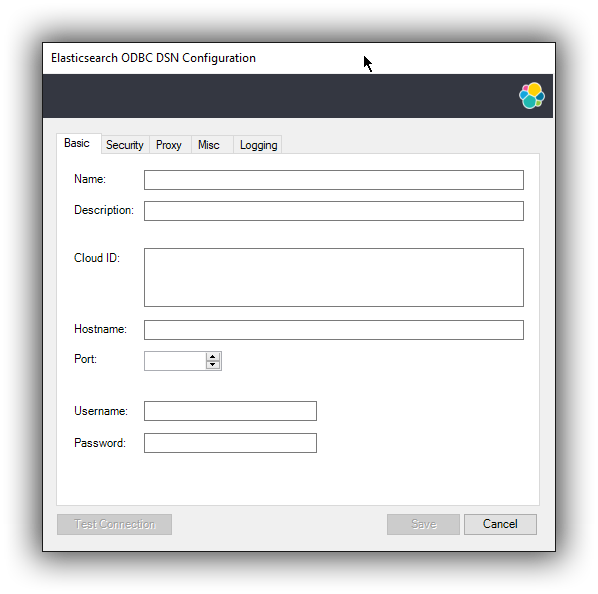 Elasticsearch SQL ODBC Driver DSN Editor. This new window has three tabs, each responsible for a set of configuration parameters, as follows. This is the name the DSN will be referred by. The characters available for this field are limited to the set permitted for a Registry key. This field allows a arbitrary text; generally used for short notes about the configured connection. Example: Clear-text connection to the local [::1]:9200. This field requires an IP address or a resolvable DNS name of the Elasticsearch instance that the driver will connect to. The port on which the Elasticsearch listens on. If left empty, the default 9200 port number will be used. If security is enabled, these fields will need to contain the credentials of the user configured to access the REST SQL endpoint. At a minimum, the Name and Hostname fields must be provisioned, before the DSN can be saved. Connection encryption is enabled by default. This will need to be changed if connecting to a SQL API endpoint with no cryptography enabled. The communication between the driver and the Elasticsearch instance is performed over a clear-text connection. This setting can expose the access credentials to a 3rd party intercepting the network traffic and is not recommended. The connection encryption is enabled, but the certificate of the server is not validated. This is currently the default setting. This setting allows a 3rd party to act with ease as a man-in-the-middle and thus intercept all communications. Enabled. Certificate is validated; hostname not validated. The connection encryption is enabled and the driver verifies that server’s certificate is valid, but it does not verify if the certificate is running on the server it was meant for. This setting allows a 3rd party that had access to server’s certificate to act as a man-in-the-middle and thus intercept all the communications. Enabled. Certificate is validated; hostname validated. 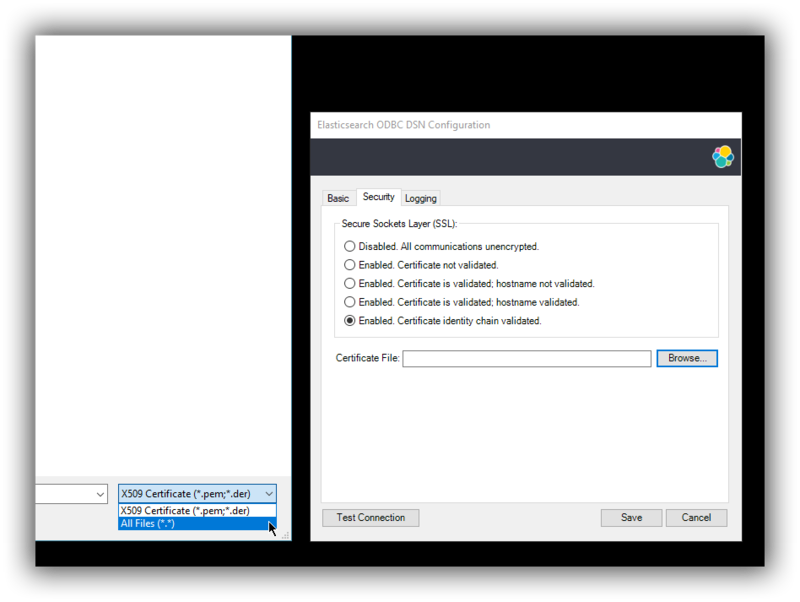 The connection encryption is enabled and the driver verifies that both the certificate is valid, as well as that it is being deployed on the server that the certificate was meant for. Enabled. Certificate identity chain validated. This setting is equivalent to the previous one, with one additional check against certificate’s revocation. This offers the strongest security option and is the recommended setting for production deployments. In case the server uses a certificate that is not part of the PKI, for example using a self-signed certificate, you can configure the path to a X.509 certificate file that will be used by the driver to validate server’s offered certificate. The driver will only read the contents of the file just before a connection is attempted. See 2.5 Testing the connectionedit section further on how to check the validity of the provided parameters. 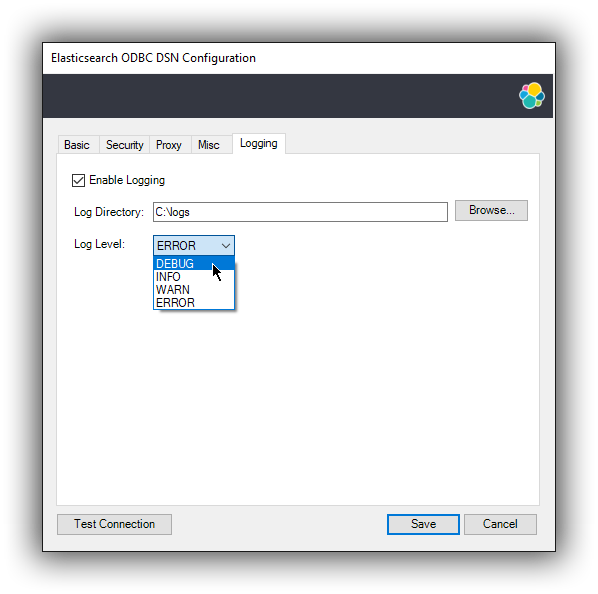 Enable Application ODBC API logging. Ticking this will enable driver’s logging. A logging directory is also mandatory when this option is enabled (see the next option). However the specified logging directory will be saved in the DSN if provided, even if logging is disabled. Here is to specify which directory to write the log files in. The driver will create one log file per connection, for those connections that generate logging messages. Configure the verbosity of the logs. When authentication is enabled, the password will be redacted from the logs. Debug-logging can quickly lead to the creation of many very large files and generate significant processing overhead. Only enable if instructed so and preferably only when fetching low volumes of data. When connection testing, all the configured parameters are taken into account, including the logging configuration. This will allow early detection of potential file/directory access rights conflicts. See Alternative logging configuration section further for an alternative way of configuring the logging. Once everything is in place, pressing the Save button will store the configuration into the chosen destination (Registry or file). Before saving a DSN configuration the provided file/directory paths are verified to be valid on the current system. The DSN editor will however not verify in any way the validity or reachability of the configured Hostname : Port. See 2.5 Testing the connectionedit for an exhaustive check. 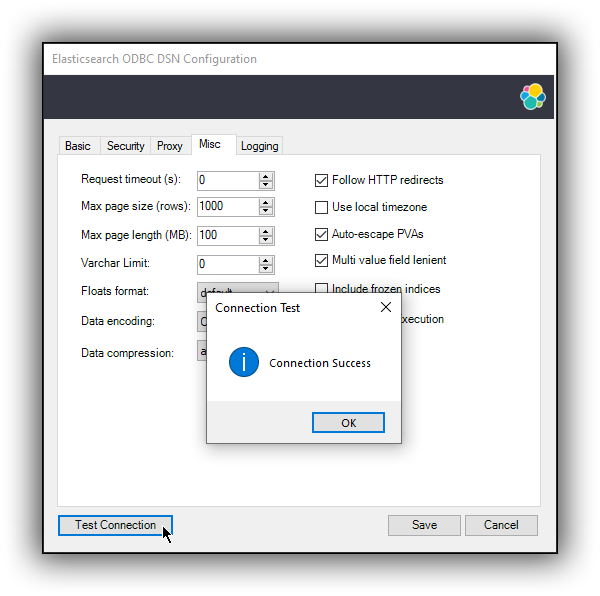 Due to the specification of the ODBC API, the driver will receive the configured DSN parameters - including the logging ones - only once a connection API is invoked (such as SQLConnect or SQLDriverConnect). The Driver Manager will however always make a set of API calls into the driver before attempting to establish a connection. To capture those calls as well, one needs to pass logging configuration parameters in an alternative way. The Elasticsearch SQL ODBC Driver will use an environment variable for this purpose. Configuring an environment variable is OS specific and not detailed in this guide. 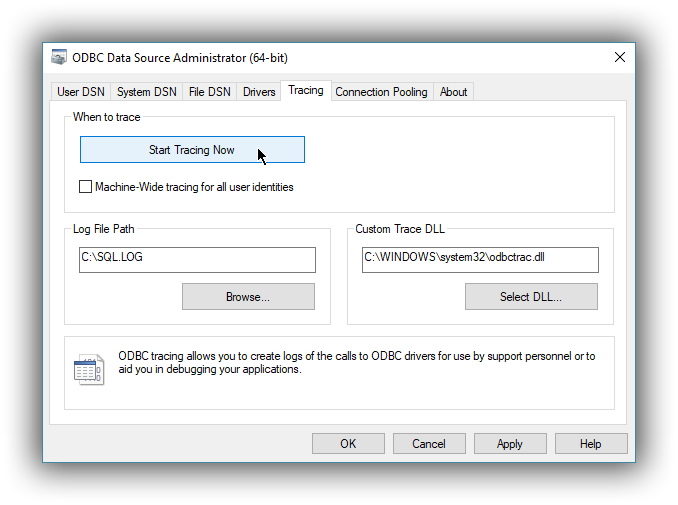 Whether the variable should be configured system-wide or user-specific depends on the way the ODBC-enabled application is being run and if logging should affect the current user only or not. [level] is optional and can take one of the following values: debug, info, warn, error; if not provided, debug is assumed. When enabling the logging through the environment variable, the driver will create one log file per process. Both ways of configuring the logging can coexist and both can use the same destination logging directory. However, one logging message will only be logged once, the connection logging taking precedence over the environment variable logging.